Khartoum — President Omar Al Bashir has pledged to release all journalists detained by security forces and solve all problems of press and media in Sudan, however agents of the National Intelligence and Security Service (NISS) continued to detain and harass journalists as he spoke. At a meeting on Wednesday with leaders of the mass media, editors-in-chief, and columnists at the presidential guest house in Khartoum, Al Bashir said that there is an intention to form a committee to be chaired by a national figure acceptable to all people to prepare a draft of a [new] permanent Constitution for the country, the official Sudan News Agency (SUNA) reports. Al Bashir reiterated that "the door of dialogue is open for all to achieve peace and get the country out of political and economic crises". Al Bashir affirmed readiness of the state to abolish taxes and customs duties on press industry inputs, pointing to necessity of finding strong press institutions serving the country's issues. The president stressed the need to review the Public Order Law and address the disadvantages of its application . He affirmed the necessity to solve youth issues, indicating to right of young people to achieve their aspirations and that the country has made a start on oil exports to fund expansion of services in the fields of education, health and roads. At the meeting, the Chairman of the Sudanese National Journalists Union, El Saddiq El Rizaigi, called for a free press that works without pre-publishing censorship or constraints. He said that that the state should play an important role in supporting the press and the media, especially by exempting them from taxes and solving the economic problems that face them. SUNA reports that a number of speakers at the meeting underscored existence of a real economic problem in the country, calling for work to resolve this problem and carrying out dialogue with the protesting parties. They called for enabling the accredited international mass media to convey correct information, indicating that the means of social media have become available significantly. However as Al Bashir spoke on Wednesday, reports reached Radio Dabanga that security agents stormed the headquarters of El Jareeda newspaper, arrested journalist Ali El Dali and took him to an unknown destination. 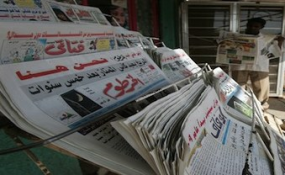 The NISS has been preventing El Jareeda newspaper from printing for more than three weeks because of its coverage of the demonstrations that have been taking place in the country for about two months, and its rejection of prior security monitoring decisions to make adjustments on its coverage, contrary to the rules of the profession. On Tuesday, the State Security Prosecution questioned two journalists and summoned others to appear after it filed complaints against them following the publication of leaflets supporting and advocating the popular movement demanding the step-down of President Al Bashir. On Tuesday evening, Shamayel El Nour and Rashan Oshi of El Tayyar newspaper appeared before the prosecution after receiving an investigation order into the complainant by the NISS. They were released with bail after the investigation. The investigation focused on Shamayel's publications on her Facebook page, in which she supported the popular movement and criticised the president and the director of the NISS for violently repressing the demonstrators. Accordingly, Shamayel will face charges of harassment, defamation of character, and false information. Prosecutors also interrogated Rashan Oshi on three charges, including incitement, demonstrations and other information-related crimes. Journalists Hussein Saad, Adil Kolor, Ageel Naeem, Kamal Karrar, Omar Jumaa, Gurashi Awad, and Ismail Bilal are still held detained by the NISS while journalist Adam Mahdi was sentenced to three months in jail by under the emergency measures and was transferred to Nyala in South Darfur to serve his prison term. Last month, the external information, under the guidance of the NISS, withdrew licenses to practice the profession for the correspondent of Al Arabiya channel Saadeldin Hasan, the correspondent of the Turkish Anatolia Agency, Bahram Abdelmonim and photographer Mahmoud Hajjaj, while refusing to renew the licenses of the correspondents of Al Jazeera, Osama Sayed Ahmed, Ahmad El Reheid and photographer Badawi Bashir.